Back when he was president, and corpulent, and somewhat indecisive, Bill Clinton was represented in the Doonesbury comic strip by a little hovering waffle. C’est moi. I am the waffle. I told you on Tuesday that you didn’t have to look up what goes on at a conventional egg farm, and that you could go ahead and buy eggs marked “free range,” even though the standard is largely meaningless. 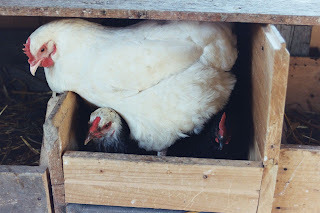 The chickens outside my door are taking me to task on this, quite rightly, and I am changing my stated position. All of us, collectively, walking around with our fingers in our ears saying “LA LA LA,” and buying food without thinking about it very much or questioning it at all, have driven the bus to this place. We gotta get out of this place. Forget the nice picture on the egg carton label in the store. An egg factory can say its hens are “free range” if, at one end of the cavernous warehouse that houses tens of thousands of birds, there is a cat-door that leads outside. It doesn’t matter where it leads, and it doesn’t matter if none of the very miserable birds ever use it. Hey, man--they have the option. To make it possible for miserable birds, denied most of the happy jobs that occupy a hen’s day (picking through the grass, rolling in the dust, finding some privacy to lay an egg) to live in close quarters without pecking each other to bits from boredom and hysteria, the birds are de-beaked. “De-beaked” is an awful word, but let me assure you it is a euphemism even so. Are your fingers creeping up towards your ears? It isn’t pretty information, I know. But this is all done for us, the consumer. In our names, and then we support it with our dollars. We do have to start somewhere if we are going to fix this mess. Why not with eggs? I stand by a couple of things I said: one, buy eggs from people, not corporations. I gave you some links to find some of those near you, if you don’t have a ready source, and here they are again: one, two and three places to look for good eggs. Two, pastured hens lay tastier eggs, so you will be well-rewarded for the little bit of expense and trouble. 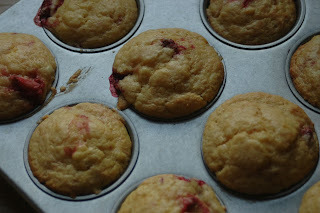 In compensation for harshing your mellow, here is a recipe for muffins that taste like cheesecake, and yet are good for you. They are even better for you if you add a quarter cup of oat bran to them, but that’s all up to you. Happy eggs make them a vivid yellow that will give you pleasure in the morning light. 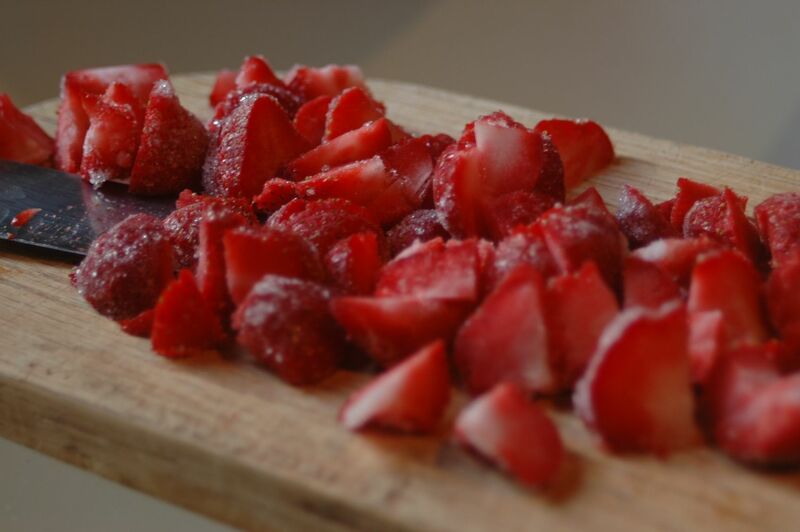 Lay the strawberries on a cutting board to thaw slightly while you get everything else in order, otherwise the berries will fly around the kitchen like asteroids when you try to chop them. Preheat the oven to 350. Lightly grease your muffin pans, or line them with papers. In a medium bowl, combine the flour, salt, baking powder, baking soda, salt and sugar. In another medium bowl, beat the buttermilk into the ricotta, then add the eggs one at a time, beating well after each. 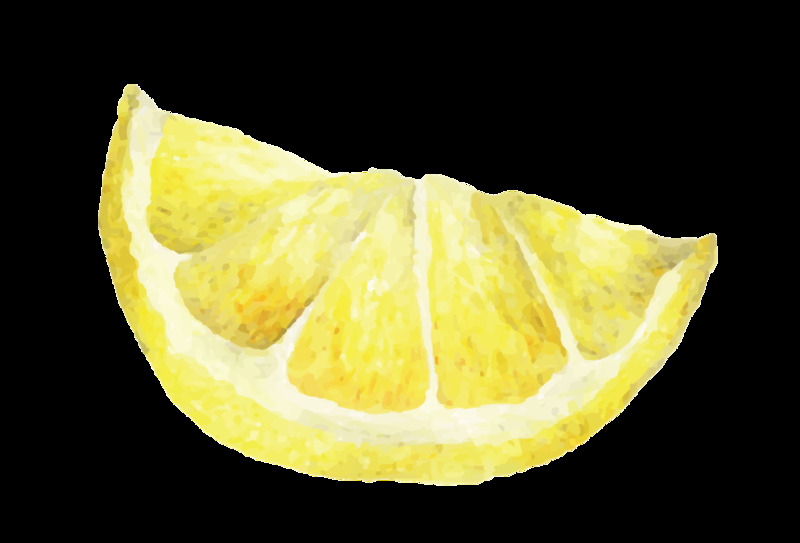 Stir in the vanilla and lemon juice. 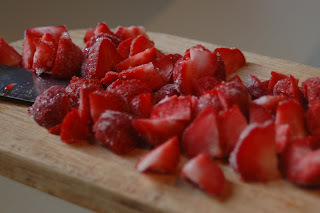 Coarsely chop the now-slightly-relaxed strawberries. Add the ricotta mixture and the strawberries to the dry ingredients, stir once, then dump in the melted butter (you just don’t want the melted butter to hit the cold stuff first, or it globs), and combine the mixtures quickly and lightly. Don’t over-beat; just make sure all the dry stuff is wet, and accept a few lumps. Portion out among the cups, filling them to the top. Bake in the center of the oven for 20-25 minutes, or until lightly browned and the top springs back when you poke it gently. Let cool in the pan for ten minutes if you can stand it, as these are soft and will benefit from the chance to firm up a bit, then remove to a rack. The original recipe called for cherries, which has merit as an idea, and I think peaches or raspberries (no chopping!) would be delicious, too.